It’s the little umbrella in the secret formula that sells it. So apparently Tyler DOES have a power, it’s the power to NOT become a super (or at least anything obvious) and it’s so powerful that when Toby tried to empower him it caused such a disruption Toby had to undo it to save the world. Although apparently it didn’t save him from losing several weeks of memories trying to read a magical book as we learned early on. Only a day and a half of memories, but that’s quibbling :-). Seriously, though – the Headmaster noted to Lady Alexandria that the odds are over fifty percent that the children off metas will be be more powerful than their parents with the meta-effect being reinforced. And in the other timelines we saw in the Castle Beyond Space And Time, Tyler did seem to have that kind of power. The final Tyler that “our” Tyler talked to said he might be the “most important Tyler of all”. So, what if “our” Tyler really has that reinforced meta-effect, but instead of him getting Omega Level Two (or even Level One) powers, the meta effects “cancel out” in a way that makes him essentially Omega Level One ordinary? In a paradoxical way, he’s so powerfully ordinary that no attempt at giving him powers has a chance at succeeding, his whole being rejects it. It can’t even get enough of a grip on him to do any serious damage while failing. It can’t help but have some effect on the fabric of the world around him – hence the “destiny” factor that Toby can sense – but other than that, nada. The slight variation in Toby’s DNA prevented the “cancellation” effect from happening, so he has powers. Totally blind speculation, and probably all wet, but speculation is a fun pasttime between pages :-). The “most important” part — I thought that referred to Tyler’s choice to let super-powers stay in the world, but I like your hypothesis a lot. Let’s not forget that (as Moonshadow) he’s also been able to inspire his fellow PS238 students to not only do good/heroic deeds, but also to work together as a team. Look at the effect he’s had on Julie (84)! Given some of Revenant’s comments about how metas tend to see normals (specifically with their attitudes that normals are useless & should keep their noses out of anything beyond a 9to5 day job), imagine Tyler finally showing his friends that Moonshadow — their inspirational hero — is also a normal. That could be the one thing that prevents some really ugly possibilities from happening. Tyler’s parents are a horrible example of “power corrupts”, after all. Toby’s super power is … The ability to survive things that should either kill you or give you super powers. Apparently he just survives like the energizer bunny. So, basically, he’s Titus Misanthrope of Nebonic fame? What if Tyler has a camouflage power which prevents his powers from being discovered instead of paradoxically preventing him from having any. Think about it between what happened to Number 1 and the Rainmaker, as well as Praetorian, what the crew did to girl with subtle mind control powers in FFN, along with witch hunts throughout history this would be a useful power. It would also allow for other powers as it would prevent Cecil from being pinged regardless. Well we know from seeing future Moonshadow that he doesn’t get powers (from the arc where he decided if supers would be allowed to continue). But like any flashback story knowing the end result does not preclude the journey being interesting. Knowing the end result can change your actions, changing the end result. Tell that to Oedipus and the Theban royal family. The Oracle of Delphi was all about self-fulfilling prophecies, as was the seer in the recent Marvel Civil War 2 arc. Didn’t always work that way, but it happened enough that you shouldn’t trust such prophecies too far, might just be that if you DO act on the prophecy, you cause it to happen. Either that or knowing the future is irrelevant. It’s all per-ordained, there is no free will, and no matter what you ‘decide’ to do, the predicted future will occur because it was already decided. Not unlike time travel stories where trying to change the future makes it happen, as it turns out, you going back in time to change it was part of history, and you can’t change it because it’s already happened. I’m sure he doesn’t get powers (as it’s kinda his thing), but I don’t think we know that from Future Moonshadow. Working with the Revenant doesn’t mean he doesn’t have powers. Also we have established that a character named paradox comes to help fix certain missing gap, temporal confusion, and moments where one would hear a conversation from their future self even if things change… So the future is not set in stone. But he will probably stay powerless anyway sense super powers can remove common sense and common sense his is real super power…. Which is even more rare in a little kid. (1) His reply – “Oh…. Oh! I remember this now! Wow. It’s been a while.” Theoretically, Cecil could be remembering Tyler relating the story to him, but it feels more like Tyler remembering his experience. (2) The costume clearly has the Moon Shadow logo. I suspect Cecil would go with his own identity (whether open or secret) rather than recycling Tyler’s alter-ego. (3) I have trouble believing Cecil would ditch his coat, but the future Moon Shadow has no coat in evidence. (4) On the other hand, the first look at the costume seems a clear callout to Tyler’s Moon Shadow gear – a helmet (with a visor instead of a mask/face-guard combo), styized shoulder pads in the same round turtle-shell shape, gloves almost to the elbow, and what appears to be a cape (we just see where it connects to his shoulders). (5) He readily gives Tyler directions on where to go, with landmarks, without hesitation, as if he’d been there rather than just heard the story. Paradox is possible, but I’m betting future Tyler. That sort of interaction doesn’t seem like the kind that would generate a paradox. First panel you can see Ron longing for powers again. Also its interesting to realize that Ron is just learning about Tyler’s parents now. Its clearly common knowledge for the teachers, well not the exact details but the whole Tyler suffered from his parents misguided attempts to give him powers thing. Its interesting to see that its not common knowledge among the students. I think Ron can definitely relate with regards to stage-managing hero parents. I was referring to how Tyler had to look after his physical well being against his parents. The students seem to believe that Tyler is mostly bummed that he doesn’t have powers and can’t live up to his parent’s expectations. The teachers seem to understand that his “parents” might just freaking kill him if he’s not careful and Tyler knows this. Seeing Tyler explain just now how dangerous his “parents” are to a close friend made me realize that the real danger which to Tyler overshadows the whole fear of letting down his parents is not common knowledge among the students but just the teachers. Ron just recently learned that pain is painful so hi might be able to relate to Tyler on that account. Toby could relate to Ron on the whole stage managing parents thing, as well as the great responsibility thing. Both Toby and Ron have issues with feeling like they are causing issues in their families. They also both think they should be able to fix the issues. Its also for both of them beyond them and to fix the issue because its not really about them. Ron’s mother resents that her own accomplishments are overshadowed by her husband, but she mostly complains about things related to Ron. Tyler resents that his “parents” are bigots. The way they treat Tyler with Toby is the lesser of the two evils but Toby doesn’t remember the greater evil and Tyler is getting better but lashes out at him sometimes because he’s connected to all this and actually listens to him. So Toby thinks his existance caused the problem Tyler has with his “parents” and is trying to fix it but won’t be able to because its not about him or even Tyler’s lack of powers. I agree with Ron’s conclusion. They are there to have fun and eat pizza, and they’ve had the pizza! A nice common sense plan, it will never succeed. Semi-off-the-wall comment, but I just realized why, narratively speaking, Ron lost his powers and gets to get a different suite. Julie/84 is the main-cast FISS, and there don’t need to be two of them. Even if them being the most common sort of super is a plot point, Ron dodged that by being Atlas’s son, which made his FISS status “special.” And thus obviated the “it’s a common power” trope that could have made a second FISS in the main cast story-useful. Instead, we’re getting a lost-and-regained powers arc and then he’ll fill a different role. Except narratively speaking there’s no requirement of a ‘One FISS limit’, not when there are separate valid reasons for both FISS to exist in the story. Just as we have two seemingly non-powered kids (Tyler and Cecil) in the story, each serves a different narrative purpose. Right now we’ve lost the original narrative for Ron with the lost of his powers and is onto a different narrative without completing the original which has ended up in limbo with Ron’s depowering and the effective loss of his power. Sure, there’s no requirement for a “one FISS limit.” But if Aaron finds his plot ideas for Julie and Ron to begin repeating themselves because of their shared powerset, he might change one’s powers. Or maybe Ron’ll get his powers back as well as the upgrade. Complete the superman package with super-senses, which are the source of his near-divinatory powers we’ve seen at this party, perhaps. This is pure speculation and meta-analysis; I won’t hang a hat on it. Maybe his power is being nonreactive to most other powers? Sort of like infinitely high spell resistance. Don’t forget, it might not be unusual that the difficulty in giving Tyler powers might not be unique to Tyler. It could just be difficult to give powers to any other non-super. Also, how many of the things the Powers tried were fraudulent (and dangerous) gimmicks? I’m going to guess most of them were fraudulent gimmicks. Its likely many would not have been that dangerous though I mean safer alternatives are likely cheaper and less likely to get you into serious trouble. Heck some of them might skirt the law by not promising anything and making things sound worse than they are. Maybe his natural power set is very resistant to addition or modifications. What powers he has has been debated a lot. It’s getting harder to side with the view that he is powerless. Yes having evidence of the kinds of things that they did to try and empower him, things that likely should have been lethal or at least crippling it’s REALLY difficult to get away with saying he has no powers at all since he survived them like he did and did it without any evidence of powers. But his parents have long been established to be mentally ill with a very distorted view of reality so it’s no surprise that they never really think about why after all that he never developed powers or died from it, to them it’s all ‘the Universe simply waiting until the proper time to reveal his powers’. That’s an interesting point. They probably would not have been satisfied with him demonstrating a subtle or otherwise unimpressive power; they expect his “great destiny” includes powers within the same ballpark as their own. It would have been reasonably easy to come to the delusional conclusion that, because nothing had worked but nothing had killed him, he must have a subtle protection-from-harm power (like a more low-key version of Guardian Angel’s friend). And yet, they never tricked themselves into coming to that conclusion. I wonder: if he’d demonstrated a minor power, like Jubilee or Dazzler when the writers are being particularly uncreative with what they can do, would his parents have been “satisfied,” or thought that surely it was just the first step towards his TRUE destiny, that his powers must be layered and this is just the first manifestation? I mean, you could make argument that he’s got SOME sort of power. But it certainly isn’t an argument his parents want to make. If Toby weren’t around, they’d probably still be convinced he just has yet to manifest one. It would also be interesting to see a “what if” story where Tyler did gain powers, with Toby still around. Would his parents notice? Or are they satisfied with Toby alone? We have seen several what-ifs where Tyler gained powers. The first version, Elemental Powers, was a brutal thug who likely crippled his Suzy for life, nearly killed his Coach, and required a super-hero army including his disappointed parents to bring him down. The second looked to have Gravity powers and was a true hero, but his world fell to those aliens because it wasn’t him that the aliens sampled the DNA of. The third well he noted he was what Tyler-Prime’s parents dreamed of but because of his screw-up he no longer had parents they were all part of the group mind he accidentally created. I think Tyler-Prime would have to have serious and obvious powers before his parents would actually acknowledge him/them, subtle powers (like one that prevented him from becoming a super, using super-items, etc) they’d most likely reject because it would mean accepting Tyler would never be anything but a normal human in all respects and they look down on normal humans. They don’t have the mental ability (from what we’ve seen) to handle accepting him as an otherwise powerless normal human, although maybe we’ll see a lead-in to a storyarc where his parents are finally forced to confront the reality that they so reject at which point (since I don’t see the comic crossing into Cerebus territory) we could see them finally admit how wrong they’ve been both about their son and normal humans in general and work at being better people. Was he changed in any way by the pivotal role of making the choice regarding the future of powered humans? Is he some sort of anchor point that’s in some way protected or how changing him will effect all those his decision would effect? This may even explain how his clone developed such an extreme power. Also how his twin has been the only means to effect his power set / give him powers / remove given powers from him. 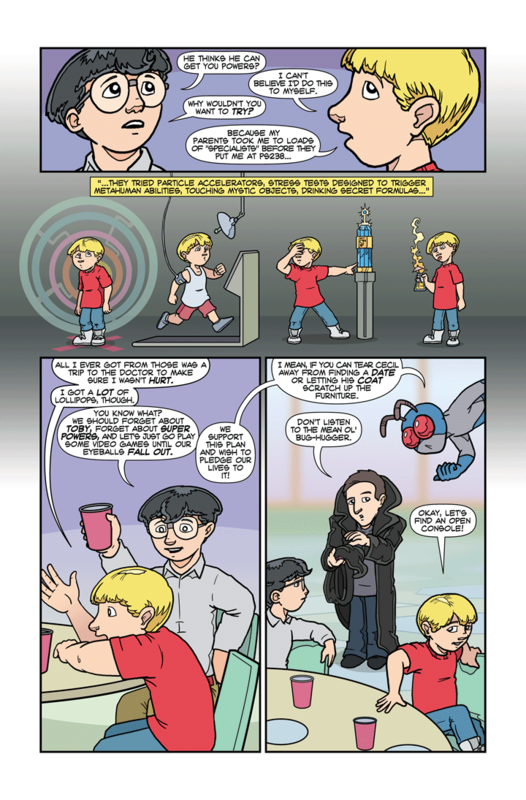 I think The Flea’s tied with 84 and Cecil as the nicest of the superpowered kids. I agree. I love the Vegas storyline because he focuses on them so much. I’d describe Flea as benignly sarcastic more than nice. He took pride at being the least wanted for an junior super teams (IIRC a wig made of live crickets was mentioned). While his antics and comments seem to mostly be in good humor he isn’t exactly polite all the time. 84, on the other hand so sweet that if you spend too much time around her you risk diabetes. Yes Flea has zero problems if he doesn’t like someone and/or thinks that they’re a jerk or otherwise deserving simply using his powers to annoy or harass them in some fashion (like when he sent a group of insects to infest Von Fogg’s armor), which doesn’t put him the ‘nice’ category. He’s nice to people he likes not so nice to people he doesn’t, whereas Tyler and Julie are nice to everyone even when they aren’t really deserving of it. Flea’s got a ways to go before he’d be in the same range as those two when it comes to being nice, although at least he’s discriminating with his behavior which keeps him likeable. I think that Julie is tied with Suzie as nicest. Cecile isn’t exactly nice, he just doesn’t hate many people. His parents were right: he had a Destiny! It was to be the one who chose whether or not humans continued to get superpowers. In order to be unbiased, which he had to be to be selected, he COULDN’T HAVE SUPERPOWERS! His Destiny has been fulfilled. And the Revenant doesn’t refuse to work with the superpowered, he refuses to work with those whose powers include super egos from having superpowers or those who substitute raw power for a little forethought. Tyler is genetically capable of having superpowers; ALL of his alternate selves are massively superpowered. The fact that an exact duplicate has massive power indicates this is also true in this reality. The fact that he not only doesn’t, but persistently cannot gain superpowers, indicates something else is STILL in play. He will remain powerless, not because he will work with the Revenant in the future, but until whatever is keeping him powerless is satisfied. They’ve actually come close to doing that in the original Marvel RPG in their Nightmares Of Futures Past modules, a mutant whose two powers were to appear normal (although she could generate an area affect to cover other mutants) and to generate random mutant signatures in the area (but sacrificing the protective screen). So she was almost a mutant whose mutation was to appear as a normal human to all detection.